Where does modern art end and plagiarism begin? I thought I had made my peace with the death of originality. Personally, I do not believe that originality has died, but I recognize that the obituaries cannot exactly be ignored. I keep abreast of whatever is being said about the death-of-originality movement’s dead white males, Marcel Duchamp and Andy Warhol. And I try to see as much as I can of the work of practitioners who, paradoxically, are alive and kicking, beginning with Jeff Koons and Richard Prince. Mostly, I don’t comment on this stuff, figuring that as a critic who still believes in originality I am under no obligation to chronicle its demise. But a comment is in order now, because the very people who brought us the death of originality are increasingly preoccupied with the defense of their own originality. Nobody has said it better than the art historian Rainer Crone, who worked closely with Warhol from 1968 onward, and recently wrote that Warhol’s unique contribution to contemporary art was “the rejection of authorship as an essential feature of authenticity and originality.” I guess that means that the death of originality is a new form of originality. Warhol’s silkscreen technique, which allowed for the repetition of the same image over and over again, could be said to be a send-up of plagiarism. Rainer Crone made his statement about the rejection of authorship as a form of authenticity in a letter to The New York Review of Books, commenting on the refusal of the Andy Warhol Foundation to authenticate a silkscreen self-portrait that Warhol instructed somebody else to make. Warhol had signed the painting and authorized its inclusion in his first catalogue raisonné, where it was even reproduced on the cover. I am not sure that anybody has actually said that this silkscreen is in fact a plagiary, but the Foundation will not say that it is real, either. Crone thinks the disputed Warhol should be authenticated, along with nine others done at the same time. In addition to everything else, he sees this silkscreen self-portrait as a stellar example of the originality of Warhol’s decision to allow other people to produce original Warhols. And to do it, moreover, when Warhol wasn’t even present; the artist spoke to the fabricator on the phone, to specify the red that he wanted. As for the Warhol Foundation, I assume they also regard the rejection of authorship as a form of originality, but want to make a distinction between some anti-original originals and other anti-original originals. Will the real rip-off artist please stand up? I do understand the arguments. A snow shovel or a urinal exhibited by Duchamp in a gallery, a silkscreen reproduction made by Warhol of Leonardo’s Mona Lisa or Last Supper, and a balloon dog that Koons has cast in shiny metal and exhibited at the Metropolitan Museum of Art will strike us as different from the snow shovel in one’s garage, the urinal in the men’s room, the Mona Lisa in the Louvre, The Last Supper in Milan, and a balloon dog at a street fair. But different in what way? And different to what purpose? These are the issues that really need to be addressed. And here is where matters become increasingly murky, because many people are all too eager to see Duchamp’s readymade and Koons’s appropriation as just the latest twist in a tradition of copying, quoting, borrowing, replicating, and forging that goes back to the Ancient Greeks, if not earlier. In 1978, when the Whitney Museum mounted a show called “Art About Art,” the art historian Leo Steinberg—author of penetrating studies of Leonardo, Michelangelo, and Picasso—provided an introduction in which he did not exactly foreclose the possibility that the history of art might be viewed as a proto-Duchampian goof, a goof underscored by his insistence on giving the subsections in his essay funny headings like “The Stainless Steal” and “The Cover-Up.” Warhol crops up in the first chapter of an erudite new art historical study, Forgery Replica Fiction: Temporalities of German Renaissance Art, by Christopher S. Wood (University of Chicago Press). Wood appears to concur with Crone’s view of the originality of anti-originality, observing that “to represent the copy is to reassert the distinction between copy and original.” Wood believes the obsession with originality that dominated the Renaissance eradicated an entirely different kind of thinking, a time when “copying was the normal way to make new things.” By focusing on what he maintains is an earlier mode of thinking, I cannot help but feel that Wood is presenting a backstory tailored to support, albeit in some opposites attract way, Duchamp, Warhol, and Koons. When Steinberg and Wood argue that borrowing, appropriating, copying, and even stealing are at the very crux of the Western tradition, they must be aware that whatever the scholarly import of their work, they are simultaneously readying their readers for the readymade. 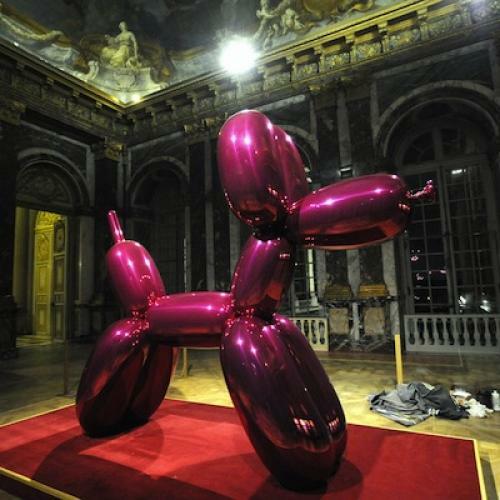 Jeff Koons, when accused of copyright infringement, tends to settle out of court. One has the impression that he prefers writing a check to actually discovering what a judge or a jury might have to say. But in his heart of hearts Koons probably feels that if Poussin became Poussin by stealing from Titian and Raphael, why on earth is he being bothered by questions of copyright and fair use? With the balloon dog case, he has decided to go on the offensive. Crone’s argument that “the rejection of authorship” can be “an essential feature of authenticity and originality,” although absurd to some, is not so easily refuted. One can, if so inclined, certainly find support for this view in the history of Western art. Don’t the gorgeously impersonal, porcelain-like surfaces of Ingres’s greatest portraits suggest a rejection of authorship? And can’t we see an act of appropriation in Titian’s wholesale incorporation, in his late Pietà, of Michelangelo’s Pietà? Those who are appalled by the very thought of comparing Titian and Warhol will argue that Titian’s embrace of Michelangelo involved a deeply felt salute from one master to another. But some will say that is precisely what Warhol was doing when, toward the end of his life, he appropriated Leonardo’s Last Supper. I believe people who see appropriation as an expression of susceptibility are kidding themselves. And susceptibility, the sense of emotional connectedness, is what influence is all about as it unfolds in Western art, in the work of Michelangelo, Poussin, Delacroix, Cézanne, Picasso, and countless others. The chill of appropriation, with its emphasis on impersonality and anonymity, suggests not the great tradition but the academic tradition, a calculation about the past rather than an engagement with the past. Andy Warhol, for all that his admirers may want to portray him as a trickster, was more like the worst kind of academic artist, for whom copying is not the starting point but the defining point. No wonder some words from Sir Joshua Reynolds, that wisest of academicians, can almost sound like a critique addressed to Warhol. “He should enter into a competition with his original, and endeavour to improve what he is appropriating to his own work. Such imitation is so far from having any thing in it of the servility of plagiarism, that it is a perpetual exercise of the mind, a continual invention.” Some would say that is precisely what Warhol did when he transformed Campbell’s Soup cans and old master paintings into silkscreened originals. As far as I’m concerned, Duchamp, Warhol, and Koons never escape “the servility of plagiarism.” Is it any wonder that Koons is panicked about being plagiarized? It takes one to know one.